Soya chunks or granules are very nutritious with a protein content equal to that of meat. Soya is easy to cook, easily available and can be substituted by vegetarians to prepare traditional meat dishes. 1. Soak the soya granules for at least 1 hour. 2. In a pressure cooker, heat oil and saute the ginger garlic paste. Add the chopped onions and fry until light brown. 3. Now add the tomatoes, green chilies and the drained soya granules. 4. Saute until the water dries up. Add salt and dry spice powders and a little water and keep stirring. Continue to bhuno this way until you get a nice brown colour. 5. Beat the yogurt and mix into the keema. Add half or 3/4 cup water ( according to the consistency you require) and close the cooker. Cook for 3-4 whisles.If you are not using a pressure cooker, then add more water and simmer to cook until done. 6. Garnish and serve.For variation you can even add green peas. cute pictures and healthy kheema. Thanks Shobha for all the healthy dishes you are linking up. My url has changed dear. For your future entries please use the new annoucnement url. I love soya and the side dish looks yummy. Nice pictorial. Delicious and healthy curry for chapathis I have to try with soya chunks. Awesome dish.. thanks for linking.. Healthy n delicious..I too posted a soy recipe today! Delicious & healthy dish, looks fabulous! 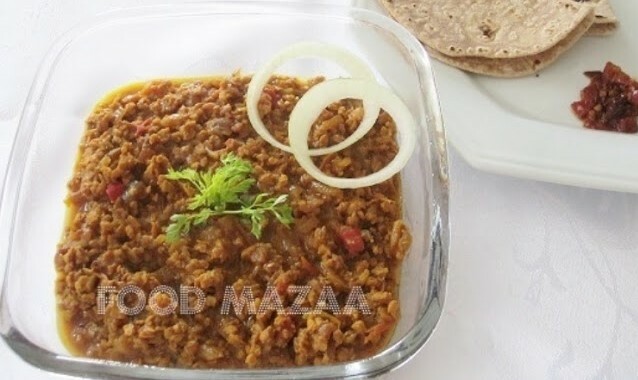 Healthy side dish for roti,nice recipe..
keema goes well with roti , bread stuffing...nice recipe..